There. I said it. I wrote it for all the world to see, if it comes here to read my blog. How do I come to this conclusion? Well, it’s because of his latest blast of doom and gloom delivered in the town of Tromsø in the north of Norway in that bit of Scandinavia that we call the frozen North. It’s just that it isn’t frozen all year round. It thaws out every year in the spring and then freezes again in the autumn and winter. According to Al Gore, that is not normal and can’t we see, that the ice is melting before our very eyes? Yes Mr. Gore. We can. And we’re glad that it does so. Every year. Otherwise, we’d be in a new ice age. All this melting ice nonsense is getting to be boring and basically, it isn’t dangerous anyway. All the polar ice could melt in a day and the sea would not rise an inch. Ice displaces itself in water. Archimedes worked it out hundreds of years ago. Back to school, Mr. Gore. Do your homework. If you want the low down on the ice figures, I found a neat website devoted to the Cryosphere. New word for you? It means the cold bits of the world. You know, the extreme north and south. 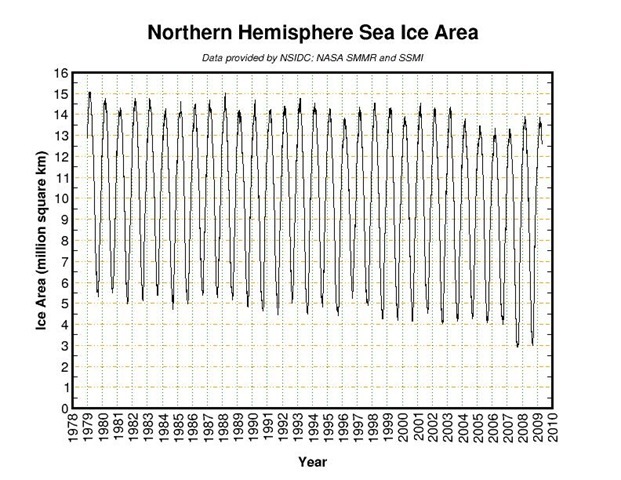 This site brings some neat graphs displaying the polar ice and indeed, the global ice cover. I’d say that looks pretty stable. Goes up in the winter, down in the summer. You know, normal. Like it’s supposed to. Variations here are minimal. Once again, that looks all pretty stable to me. Up and down like a whores drawers. Regular. Normal. And while I’m about it, let me tell you, that the ice cover has actually grown recently, contrary to all the doomsayers preferred mantra. The thing is, they show you pictures of glaciers falling to bits and melting ice masses and icebergs at the drop of a hat. Funny how you never see pictures of the millions of tons of snow and arctic ice crystals that fall each year to replace it. I suppose it must be too cold to warrant a visit in the winter. Al Gore is presently trying to drum up some interest in the coming climate talks due to take place in Copenhagen this year. That he is desperate is clear. The lies are coming home to roost and the general population of the entire world is coming to realise that this global warming crap is just that. Crap. A reason to increase taxation and no more. The creation of artificial green jobs must be funded and we, people, are going to fund it, whether we like it or not. Perhaps I wouldn’t mind so much if the Gorian lies were a little less obvious and a little more informed. Go here; and read it for yourself. Unless, of course, you find the truth to be a little too inconvenient. This entry was posted on April 30, 2009 at 1:22 am	and is filed under Generic, Global Warming. You can follow any responses to this entry through the RSS 2.0 feed. You can leave a response, or trackback from your own site. Thank you, this made my day. My boss is an idiot who follows his tweets. Well, what do you expect from the one that invented the internet, and whose bio was “Love Story”? I’m afraid that I expect no more than stupidity and hypocrisy from him. I am convinced that the title on this post is accurate! Oh, how I wish for global warming … especially after digging out 4 ft of snow in 4 days here in the Capitol. My aching back, shoulders and everywhere else. Thanks Al Gore! You are not alone Brother! Most of Europe is under snow cover. Denmark has just experienced the coldest December for years in 2009, the coldest January for donkeys years, record low temperatures for February, which also looks like being the coldest for ages..
I’m fed up with the lies and deceit.